The entire course is taught in English and uses detailed and systematic, step-by-step instruction on DVDs supported by full-time, one-on-one instruction by an experienced teacher and microsurgeon, Dr. Pérez-Abadía. 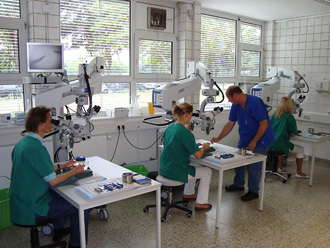 Throughout the week all trainees begin the day viewing DVDs with the specific techniques they will learn that day. Then they go to the lab and practice, practice and more practice, asking questions to the full-time instructor and reviewing DVDs as needed throughout the course. 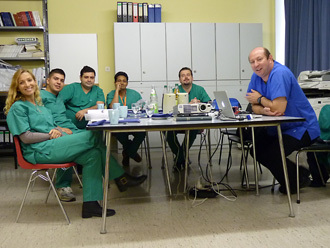 Day 1: Basic posture, handling and care of instruments and suture exercises on a non-living practice model. Day 2: Anastomosis of a live rat femoral artery. Day 3: Anastomosis of a live rat femoral vein. Day 4: Interpositional vein graft. Trainees who advance more quickly go on to perform advanced exercises, not reached by all participants. These include continuous suture, and one-way-up anastomosis. We firmly stress the importance of learning one skill solidly before progressing on to the next, while avoiding time-wasting repetition. home / Instruction / Teaching Schedule top Copyright © International Microsurgery Teaching Course. All rights reserved.